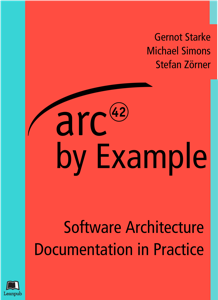 The architecture of real systems, documented with the arc42 template. Helps you jumpstart your own documentation. Written by Gernot Starke, Michael Simons and Stefan Zörner. Verbose example for the documentation of a Gradle plugin, created by Dr. Gernot Starke. Verbose example for a chess engine, created by Stefan Zörner. There is also a book available which describes the creation of this example. A series of blog posts which describe certain aspects of Gradle and put them into context of arc42. Created by Stefan Zörner. Angular 2 (German) A series of blog posts inspired by the Gradle “Starschnitt”. Created by Patrick Roos.